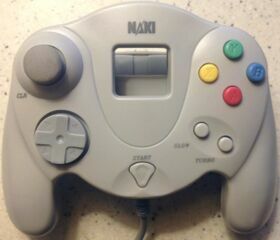 The Advanced Controller is a third-party Sega Dreamcast controller released by Naki. It is largely identical to the standard Dreamcast controller but has turbo features and came in a variety of colours. Original models came with a slightly different D-Pad and analogue stick, more akin to the official Dreamcast variants.